Sketch D Showing the Progress of the Survey in Section No. IV from 1845 to 1862. This is an exceptional example of the Civil War era 1862 U.S. Coast Survey's progress chart for the coasts of Virginia and North Carolina. Covers from Cape Henry, Virginia, south past the Pamlico Sound and Cape Hatteras, to Cape Fear. It was here, looking over the Pamlico Sound, that Giovanni de Verrazano proudly and foolishly declared that he had discovered a route to the Pacific. 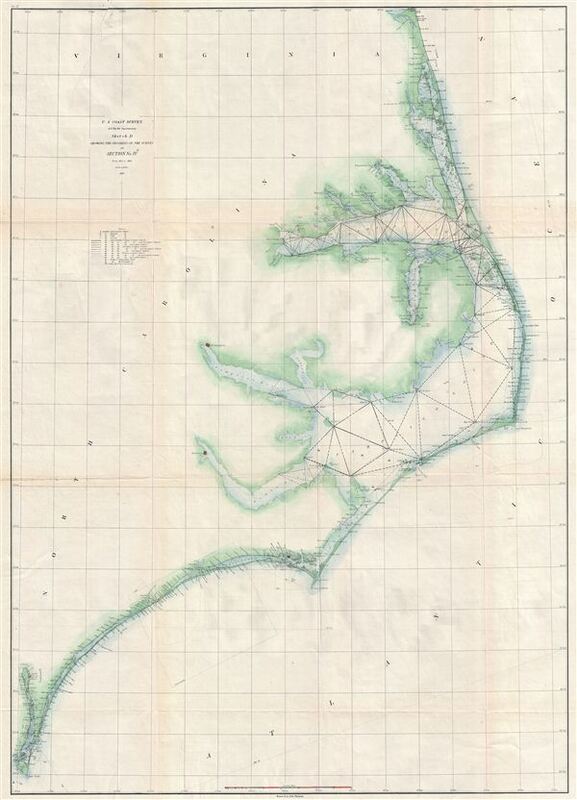 The map shows triangulation points throughout the regions as well as all major islands, rivers, and inlets. Albemarle Sound and Pamlico Sound are shown in full. Several coastal cities are noted. Lighthouses, ports, cities, beaches, and other sites identified. The work of the U.S. Coast Survey, most of whose members were dedicated Union supporters, played a significant role in the superior Union Navy's ability to control the American coastlines, thereby limiting troop movements and strangling Confederate supply lines. Prepared under the supervision of A. D. Bache 1862 edition of the Superintendent's Report. Bache, A. D., Report of the Superintendant of the United States Coast Survey, (Washington) 1862. Very good. Some wear and toning on original fold lines. Backed on archival tissue for stability. Repair upper left quadrant.